Watch out … You may not like what you find down that ‘gravel’ road. It seems that the whole world has caught some kind of ‘green fever’. Billions of dollars of taxpayers’ hard earned money is being spent chasing green dreams. Virtually all essential industries have been hit – health, energy production, transportation, manufacturing, food production, environment, to name a few. In some few cases we are benefiting economically from new developments. In many other cases things just aren’t working out, except for the favored few who are well connected with politicians who write them massive cheques. It is industry lobbyists who are writing the scripts and the taxpayers who are paying the shot. One example of immediate concern to us is the influence wielded by the gravel industry. For many decades they have had their way with very little interference from those who must suffer the negative consequences of their activities. They are the ‘self-monitoring’ people who write the laws, and are in charge of enforcing them, (if you can call their feeble efforts ‘enforcement’). An aggregate industry lobbyist answered with a resounding ‘Yes!’ And in the process dishonestly branded a community group as “opposing recycling” when the truth is the group – PitSense – is emphatically in favour of recycling … but in a manner that makes SENSE! Then, when members of that group sought to refute the lobbyist’s false accusation, the newspaper refused to publish their letters. Do YOU know what is in this massive pile of demolition debris? …. Does aggregate lobbyist Moreen Miller know? Does she even care, or does she just want to be paid handsomely to say it’s OK to drop this junk 6 feet away from sources of drinking water, while pretending to be doing the ‘any recycling is good’ thing? 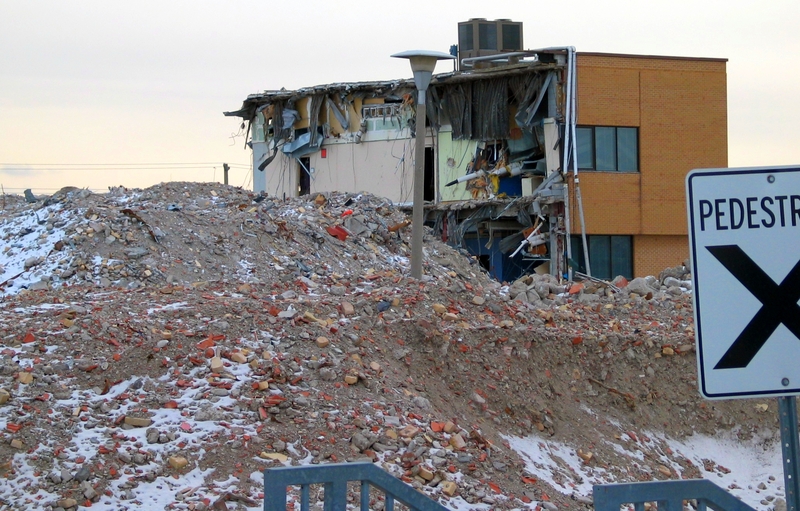 These pictures are from the demolition site of the old Brampton Hospital. Lord only knows what toxic junk is in this mess. Do we want this stuff recycled? YES, of course. But … are people who have not demonstrated any idea of how to do it responsibly the best ones to do it? NO. Are below-water-table pits in rural residential areas a suitable location for storage and/or processing of this stuff? NOOOO! But are there truckloads of money to be made here? HELL YES, which is why lobbyists like Moreen Miller are willing to bend the truth more than a little when representing her powerful industry in their pursuit of profits. We repeat – let’s keep our eyes open and WATCH WHERE WE’RE GOING – or we may end up in a very nasty place. Previous postImagination … Do you have any? Next postNeed … or Greed? SO I see you guys are in tune with the slandered PitSense group. I am acquainted with some of the members in that group and realize the passion they have for responsible mining and recycling. So you deep pocketed politicians, whose ethic do you live by? It is our ground water source and our imminent health you are dealing with here! How the hell is our tattered health care system supposed to recover if you’re adding to the wrong side of the ledger? No amount of money in someone’s pocket is worth damaging our health, or taking a life (as was the case with Jeanine Cressey). Take a closer look at what these PitSense people are doing, along with other groups trying to protect our environment, and remember this …”if you put profits before the environment then try drinking your precious dollars when your water is poisoned” , and … “if you’re not part of the solution, you’re part of the problem”.